Cranky Fitness: Standing Versus Sitting Burns HOW MANY Calories?!?! Standing Versus Sitting Burns HOW MANY Calories?!?! UPDATE! There is a more recent 2012 post on Stand Up Desks if you want to find out how this experiment went and get a few more ideas! As you may have heard by now, sitting down all day long can kill you. This is true even if you arise from your desk when the workday is done, walk briskly to the gym like the virtuous, dedicated health and fitness superhero that you are, and then proceed to exercise like a maniac for the rest of the evening. Doesn't seem fair does it? But yet another new study confirms the unfortunate connection between sitting and dying, even among those who don't smoke and who get regular exercise. And many of us have seen these studies, and promised ourselves to get out of the chair more often, and maybe even googled stand-up desks or treadmill workstations and then... forgot all about the whole deal two minutes later and somehow found ourselves watching a youtube video of a baby laughing uncontrollably at a fluffy white kitten wearing a tutu. But wait... what's even more motivating than not dying? Well, for most people--finding easy ways to lose weight! The article said you could burn 50 extra calories an hour if you stand up while you work rather than sit down. So... if I replace, say, 6 hours of sitting a day with standing, I get (in addition to the nice perk of not dying) 300 hundred extra calories to snarf up cupcakes increase my intake of nutritious lean protein and vegetables? Or alternatively, I could eat the same amount and lose 300 calories worth of extra flab a day?? I set off on a google search, and the news only got better! One standing versus sitting article said "Standing two hours a day can burn up to 280 calories daily (depending on body size and other factors); over the period of a year, this can add up to a weight loss of 20 lbs." And another white paper on weight loss at work proclaimed that "by adding only two-and-a-half hours of standing to an employee’s workday, 350 extra calories are burned per day," and holy moley, if that's true, then six hours of standing would get me many many cupcakes even more health benefits! Now of course, I'm a female human of average height, and am used to having to adjust caloric studies on "normal people" to reflect the fact I won't burn as many calories. Whatever. If I've got to knock off a bit from the 840 calories that six hours of standing would get me, well gosh, I could live with that! So what if it's not 140 calories an hour? What if it's 80, or 50, or even 25 calories an hour? If sitting for a good part of the day is gonna kill me, and if I can motivate myself to stand up using possibly exaggerated data on calorie burn, is that a bad thing? And no one seems to debate that standing indeed burns more calories than sitting--it's just hard to find out exactly how many. And so, guess what I've been doing for the last week or so? Standing up at my computer! Wanna know how it happened, what I've observed about the experience? The Low Tech DIY Standing Desk Experiment! I decided that the first step before spending any money would be to see how uncomfortable it is to work standing up. Anyway, aside from the ergonomic faux pas of having the laptop keys too high and the screen too low, the experiment was a success! I thought I'd be too distracted standing up to concentrate, but I started with just a half hour at a time and built up to a couple hours standing, interspersed with sitting breaks. It was fine! Well, my lower back was a bit sore for a few days, but it adjusted. I stopped. I circled. I extended. I tilted. I adjusted. I stood back a few feet and cocked my head. I adjusted some more. It was too freakin' much of a coincidence! It could never work, right? And voila! I now I have a perfectly serviceable stand up desk FOR FREE!!!! Thus far, I've gradually worked up to about 4 extra standing hours a day, with no ill effects. So let the calorie-burning bonfire begin! (And I'll be sure to report back if I have to start eating thousands of extra calories a day to keep from wasting away to nothing). Note: if you start googling stand up desks, it's a little depressing. They're not generally free. 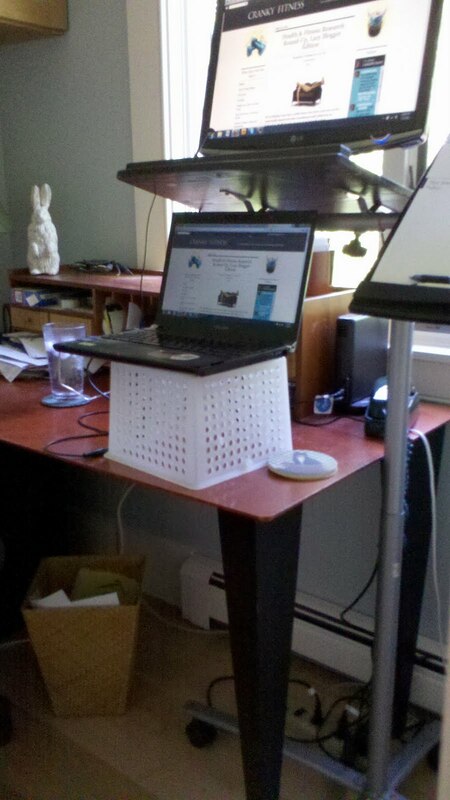 However, there a few different options for stand up desks, including some DIY types like this one. If anyone knows of any good resource links or helpful blog posts, please mention them in the comments and I'll add 'em to the list. I'm thinking next ergonomic experiment, after I'm totally comfortable with standing most of the day? Maybe a Treadmill workstation. Or better yet, I could move to the Bag Lady's ranch and start herding cattle! Anyone curious about standing up or walking while working? Anyone already doing it? What about sitting on an exercise ball while working? I've heard that's better for you because you have to engage your core to stay upright? Since I don't work at home, I don't have many options for standing or treadmill desks. I do try to get up and walk around the office once an hour or so, though! And I'm thinking about the exercise-ball-as-chair thing. Crabby, good for you for doing that. It sounds like a good thing, but it holds no appeal for me at all at this time. I am too lazy to even stand up to write. I was thinking about this standing versus sitting thing the other day and the increased risks that the study showed with sitting. Then I looked st my cat and she was sitting. 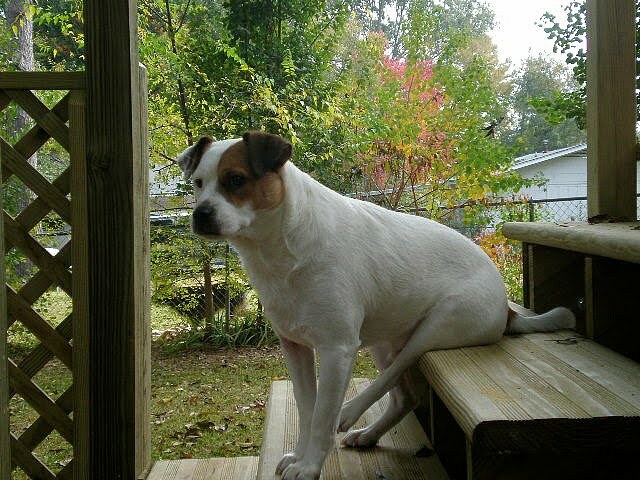 Many animals spend time sitting and so it seems to me that sitting can't be that bad in and of itself. Yeah, but how long do cats live? Even when cats are running around all day... or fishes swimming all day long.. or flies flying for hours, their lives are just shorter. Sitting more or less has nothing to do with how much shorter those animals lives are. oh- there is truth to it! As a 50 something who recently worked 4 months in acute care- rarely able to sit during 13 hour days- I lost 20 pounds. Then, I quite that job- (stressful, no life, unhappy environment too). Took a job working in the schools just 5 hours daily. Love the job, environment, and relative stress free) I have gained back 7 pounds despite running 3x weekly. Perhaps we could strap your laptop to the back of a cow.... err... on second thought, in green grass season especially, that's not a good idea! I love your "rescue" desk. I oftentimes stand up while using my laptop because I'm multi-tasking and swing by the computer to check on things. Thanks for the linky, Crabby! A co-worker recently converted his desk to a stand-alone setup. He really likes it. If he ever needs a break, he has one of those huge ball things that always make me feel like I'm about to fall off. Have been standing at my computer and desk for years. Even tilt monitors so i can stand at regular desks. It helps that i'm so short. In fact, i stand at the stove, at the counter, to fold clothes, to do just about everything. Seldom do i ever sit down. Sitting puts more pressure on the spine, and i have simply gotten used to it and prefer to stand, even in the back of the church when there are seats available. Yes, i'm weird, but maybe i'll live longer. Oh Crabby! You made with laugh out loud with that somehow-found-themselves-watching-youtube bit. I actually snorted (I hardly ever do that. really). I'm sure I've said this before, but I find this whole 'sitting all day will kill you' thing incredibly frustrating because no one seems able to offer any practical solutions for those of us who have desk jobs. Much as I might like to quit my job so I don't have to sit all day, I really can't afford to. How lucky that you found this at just the right time. I hope you find a difference. Then I hope you can convince me to do likewise. I really do spend far too much time at my computer.. standing would help. Any posture/position that involves muscle activation is better than sitting still in a chair with your back against a back rest. Most of the time, we don't even sit correctly, which could present more risks than just lower daily caloric expenditure. You are too friggin funny how you write about real things in life - that is why we missed you! Yes, I have been reading about this for quite some time now but I am at home right now & a fidgeter at that so I do tend to get up & down & up & down! Funny thing though. A while back, I hurt my back & it took 2 weeks to recoup. It hurt to sit so I was standing most of the time I could & I actually lost a couple pounds! Eager to see how the experiment works out! Thanks folks, love to hear from the Cranky Posse! Some great input here re: stability balls etc, and of course Polly's scary link about the dangers of standing in one position too long. Part of my stand-up desk requirement was that it leave half my regular desk available for sitting breaks, but this was also a great reminder to make sure to shift positions a lot and walk around a bit too. Hey, and here's another idea: a clamp-on adjustable monitor holder to attach to a desktop to put the screen at the proper height (saw one on amazon for 30 bucks). Then just find something handy to set the keyboard on to raise it to standing height. NIce set-up... I start my working day at the kitchen counter, working on my laptop from there. Then I'll usually move to the desk for a while, and return again to the counter in the afternoon. I like standing while working because it makes "thoughtful pacing" easier. And it's just more comfortable. But that's just me. I would also add that having a good chair makes all the difference to sitting. Worth spending a bit of money on IMHO. This is why I converted to a standing desk. I am easily frightened by research! But what Dr. J wrote makes a lot of sense too, frankly. 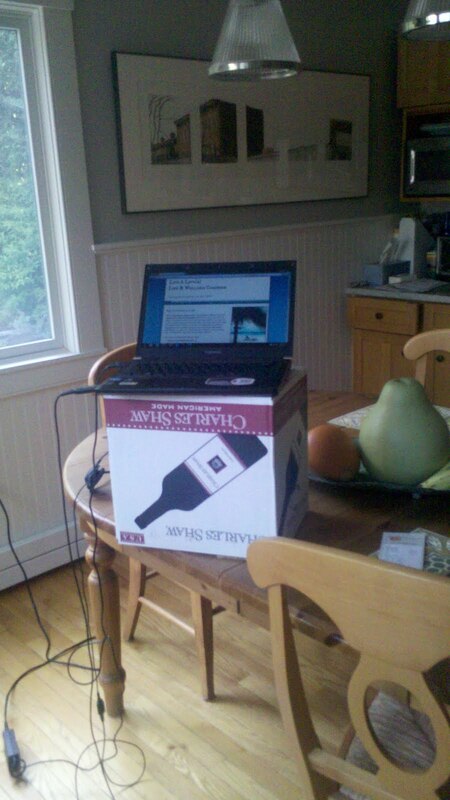 When I work from home, I too put my laptop on my kitchen counter. Sometimes I work sitting on a stool; other times, I try to stand. But I get so lazy! I need to work on this more. The table was clearly a sign of approval from God, supporting your quest ;). Just over 2 years ago, my chair broke (no not from my weight!) and I had a choice to kneel at my computor desk or put it at standing height on my chest of drawers. To the chest of drawers it went and I've not looked back since. If I've an essay to write, I'll happily stand for 5 hours or so with no probs whatsoever. The weird thing is that if you try to go back from standing to sitting, it is so so uncomfortable! Standing, as unconventional as it may be to the lazy modern human being is the way to go!! The hard part for me is that I sit still a lot better than I stand still. When I use my standing desk (a stool on top of the table), it's a lot harder for me to focus than it is when I'm sitting--I want to walk around and go do things. The thing that's helping the most is taking slightly more breaks and reminding myself to set goals of finishing a task, not waiting a set period of time before letting myself unfocus for a few minutes, but I worry about my productivity. 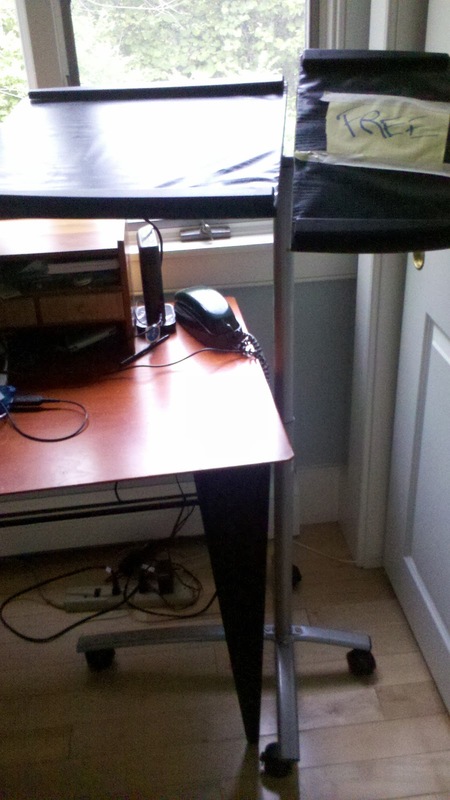 I just got a contraption that sits on top of my desk and can be moved up and down. I attached my 27" iMac to it, and am now happily standing up, typing this. It was a tad expensive, but it's very heavy-duty and I don't have any worries about my computer doing a back flip off my desk. Now I just need to get the right surface to stand on so my feet and legs don't get tired. Texas Instruments Inc, where I work at in the Dallas fab, we have adjustable desks and computers. We've had these for a few years now. We can choose to sit or stand. I love it! I've been sitting down at work for the past 10 years. Eight hours a day. I just did not like what it might be doing to me, so two weeks ago, after reading the latest report on how sitting all day can kill you, I built something at home that lifts my desk to standing height. I've been standing now for 6 days at work. Yes my lower back hurts, but I feel like my legs are alive again, they are not just two things sticking out of my body. Losing weight this easily seems like a no brainer. Especially how much I hate walking/running for even an hour. Now I have to stand up for 8 hours a day and look forward to the weight coming off, we'll see if it actually works. I've been standing for 8 hours a day since 24 May, and have yet to shed a pound. In fact, I've gained weight! Go figure, but I've gotten so used to it, and my posture has improved, so.... guess it's got some benefits! I dragged an old fashioned lectern (podium?) into my office for my laptop and that works out swell. I am MUCH more alert and can think better in the afternoon this way. I can also stand next to my radiator and so, warmer. Probably warmer too b/c I am standing. Works great! I just came across this article..but I too made a standing desk. In my cubicle using the copy paper box! I love to stand, although I do it in high heels, I feel much more alert and mobile! Besides when standing my tummy doesn't pouch out and strain my pants! :) I just feel better not sitting and my rear going numb! As far as weight loss...who knows, for me it is a mental thing! I have been standing at work for the past 2 days now. 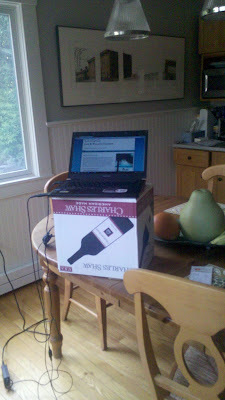 I work from home so I put my laptop on the counter in the kitchen and it works out pretty well. My only problem is I get dizzy when I stand for too long. But today was better than yesterday in the dizziness sense. Forget dying early, I wanna burn the calories. At my office, our desks are adjustable. With the pull of a lever it goes from a sitting work station to a standing one.. I prefer to stand at least half the day if I can.. Standing does burn around 100 Cal/Hr at least, but its fairly important what standing posture we have as standing longer placing more weight on one leg may cause foot stress. It also handy to have standing desk infrom of some window or bigger opening, so the body can align and keep its movement based on visual intrests. Is the bad bit about sitting the fact that I'm spreading out my backside by sitting on it, or the fact that I'm not using the muscles that would be helping me to stand? If it's the former, would kneeling in front of the desk be helpful (assuming I don't mind looking as though I am worshiping my computer)? I quit my old job to open up a business brokerage practice 4.5 years ago. My goal was to be on my own, and also a happier and healthier person. I started to work out and learned to eat clean, and slowly lost 40 pounds. I have a proper office downtown, but when we moved from an apartment to a house, I found myself working from home much more often (don't need makeup to be on the phone). I didn't have a home office yet, so found myself standing in the kitchen. And, once I out together a proper home office with desk, I'm still here in the kitchen! I think this has made a big difference, especially as the recession has eased up, work has been much busier and working out. . . Pretty much non-existent. My suggestion to those with office jobs is to do your phone calls standing up. In sales I was trained to stand up, as pacing can help the conversation,. Great post, obviously still relavent a year later! Hah, I love that DIY desk of yours! I did one of those too at work with a simple box and it's pretty cool. Now I'm trying to figure out how to do the same thing at home! 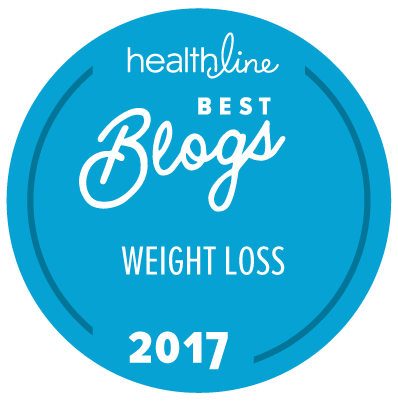 Here is at least one link to an article documenting caloric differences... which seem to be a difference of about 20 calories/hour. We have an limited stand-up desk program that is being rolled out at the office. Currently you need to have a medical reason to get one installed. I just recently was diagnosed with a herniated disc and was able to get one to help postpone the seemlingly enevitable back surgery. I'm going on week two of the desk, and I have to say I love it. I'm certainly not standing all the time, but I'm getting more and more hours in a day. I can already notice that I'm not getting as severe pain throughout the day and the numbness in my left leg seems to have vanished. It's popular with my colleagues too, I'm finding more meetings occuring in my office as stand-up meetings...and they are better meetings. More concise, to the point...I'm actually gaining more work time do to this darned desk! Who would have known! On the down side, I need to find more fashionable flats that have good cushion. Heels and the standing desk are not friends, so I'll have to retire my shoes to evening social events. I'm so glad I stumbled across your article!! I found a website (http://www.juststand.org/tabid/637/language/en-US/default.aspx) that has a calculator that determines the approximate calorie difference between sitting and standing 8 hours per day at work. I also found on Google (can't remember the site, but I asked "how many calories burned at standing desk vs sitting")a calculator that will tell you, ergonomically, how high the desk/monitor/etc needs to be for your particular height to make working at a standing desk comfortable. Hey thanks anonymous, that was very helpful! If you are a regular person who happened to find that site, that was really generous of you to share it. And if you happen to work there, feel free to email me about partnership possibilities... (email is on the schmooze page)...seems like JustStand would make a great partner/sponsor in promoting stand-up awareness. I think this is good, but I wonder about standing all day. I'm in my feet all day but if I don't move my legs swell. Yep, definitely a good idea to move around! See the updated post mentioned above for one goofy idea on that. At my company we recently built a new office, and as part of that I requested a stand up desk area. I got it, and have been standing up there for the past 3 weeks. I have minor scoliosis and wedged L4/L5 vertebrae from sitting down too much, so I literally can't sit down at work anymore without real bad pain. I used to sit all day and began to have hip and back issues. I found a Kangaroo desk station at www.ergodesktop.com which allows me to move my computer/monitor up and down to sit or stand. My goal is to stand for at least half the day. I am also considering getting a ball chair for when I do sit down. It definitely helps my SI joint and hip issues! Thanks for this, you really gave me a much-needed bout of laughter this morning! Way to go Crabby. I love your fun writing style. But seriously... When I took a full time sit down job, my chiropractor bill became significant - ow! my hips! Then hearing of the health benefits of standing I was determined to get a stand up desk. I work for a County gov, and holy keyboards are they unable to grasp the wellness concept. So w/o drawing attention to the operation, I added blocks under each of my desks feet - stabilized with 'wings' and lifted the whole thing up to standing level. I used magnets to drape fabric around the bottom so it doesn't look weird. Then I got a decent ($150) drafting stool for in between sits. I stand about 75% of the day. I'd post pics, but can't figure out how. Anyway, I can report that I no longer have hip/back issues, but I have not wasted away to nothing. Alas. Long-lived and steadfastly robust. I work for a very generious employer who paid for anyone who wanted to get a electronic standup desk which rises at the touch of a button and I use my stepper while working - I love it!! When I sit down I have a small pedal stationary bike I bought for my regular desk but my knees kepting hitting but now i just raise the desk a few inches. The desk cost a small fortune but I work at a Gold mine so they can afford it a little more than most offices and they feel our health is very important - YEAH!! I goes a long way to employee loyality. I just got a stand up station at work two days ago. I had no idea I would burn more calories??!!?! we will see how that goes! I do have to say, my legs and feet are not use to standing all day. Ouchy! I want to stand all day my entire 8 hour shift, I feel like I sit plenty outside of work. I am supper ADHD girl and I swear, I have noticed the standing helps me think clearer. I am currently fidgeting a lot while standing cus I am not use to it and it’s painful. I have on good shoes and I’m at anti fatigue pad. But I’m still not use to it. I imagine I should have eased into it. But yea, I did not. I will come back in a few months and tell you if I did indeed lose weight. Yippy for standing up! I've been standing at my desk both at home and at work for years. For my laptop, I use a bed breakfast table. It's at the right level to type (as I'm doing right now), so it comes with me when I go to work. My desktop and keyboard are also raised at work on Cambria Quartz samples boxes. I also walk in place, and average about 25,000 steps on my Fitbit a day. Yes, I get some strange looks from my boss and customers, but when I explain what I'm doing, I feel like I'm spreading the important news of taking the stress of our backs! Paying it forward! I was looking up standing versus sitting and found this. I think it is from a company that makes chairs that encourage movement (I don't work for them), but the nice thing is that they seem to support their article with actual research. They claim an additional 10 kcal/hour when you stand. Thank you Anita, that's a very helpful article and looks well researched and reasonable even though a chair company may lurk behind it. Thanks for sharing that! I have made my desk a standing desk and have lost 5# in a little over a week. My legs and lower back have been killing me, but I haved worked sitting down for almost 10 years. It has gotten to the point that I have a hard time typing sitting! Love standing and working! Last week I scored a stand up desk and stood with minimal (and I mean minimal) sitting the whole week. Tomorrow is the second week and I have to say other than working out some lighting kinks I am enjoying it. The rest of my day is spent walking back and forth from copier to fax, etc. so sitting was not a full time occupation to start. But if standing results in more calories burned I'm in. I was a cashier 20 years ago and stood for hours behind a register. My average day of standing was 5-6 hr shifts. Some days more, some less but I'm guessing that 75% of the time I stood for 5-6 hrs/day. I stayed at this job for about 8 yrs so I know first hand about this. It wasn't a summer job. Anyway, I remember that many cashiers had complaints when they got the register that had no floor mat. So that's what I recommend, find a good quality floor mat equivalent to the ones cashiers stand on. They're about 3/4 to one inch thick and really help foot and back issues. A good pair of walking shoes like the ones nurses wear is also something to think about. When I was a nursing student we were told to get good quality walking shoes because we would be on our feet for hours. So that's a big help: a good floor mat and walking shoes. Should help. I've been standing for two years using a makeshift standing desk that is sturdy and cost me nothing, plus a high density foam floor mat. I began standing to improve my muscle strength, not lose weight, but I did lose 15 pounds over the two years. I do occasional squats and other exercise while standing. My partner tried it, though, and had to stop because his feet hurt too much. It sounds like a good thing. I really do spend far too much time at my laptop. Helpful for me.